Engine Size: 1800 cc 2 Cyl 110c.i. 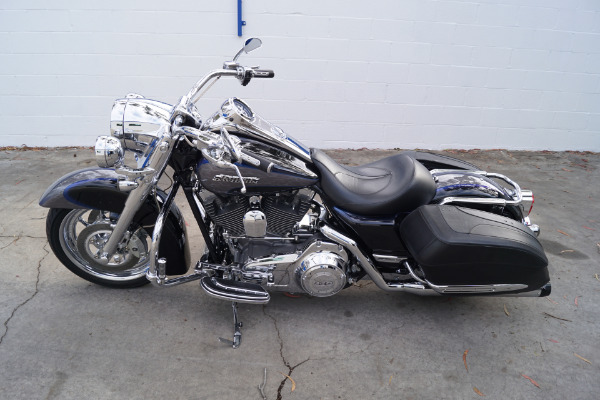 Here's what you're looking for! 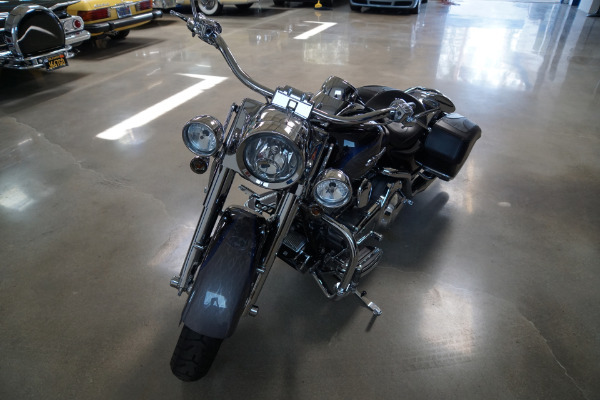 For all intents and purposes probably the best cruising/touring motorcycle ever built! 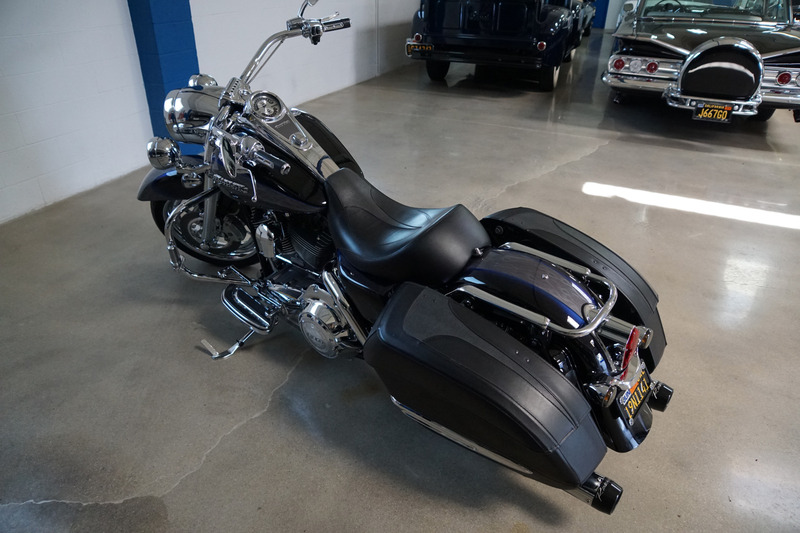 The 2008 FLHRSE4 Screamin' Eagle Road King in the exclusive 'Screamin' Eagle' color combination of 'Black and Silver' paint with Ghost flames and with a fully chromed engine and only some 11K original miles and with all the extras! 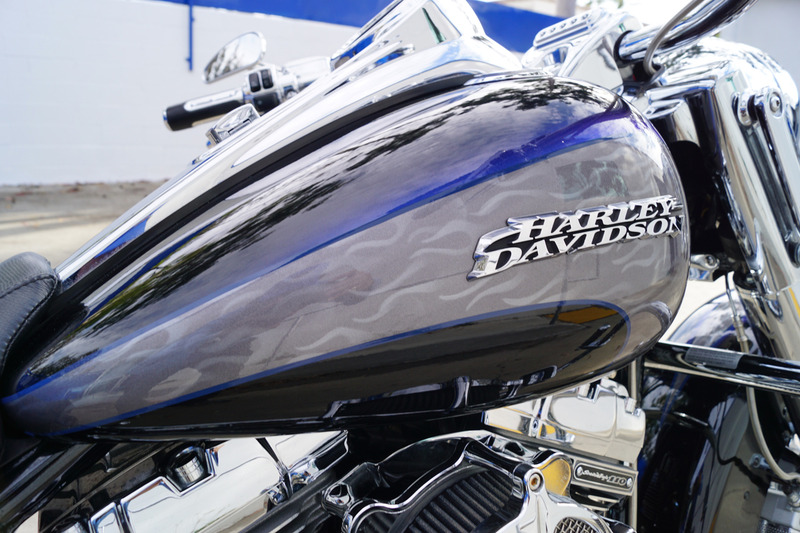 In the world of motorcycling, Harley Davidson's Custom Vehicle Operations (CVO) - makers of the Screamin' Eagle line - is the equivalent of BMW's M division or Mercedes-Benz's AMG arm or Audi's S team. The objective of these in-house tuning studios is similar: To produce high-performance variants of core products in limited numbers. There's still nothing quite like the sound of a big V-twin engine or the feeling of opening up said V-twin when the mood strikes. 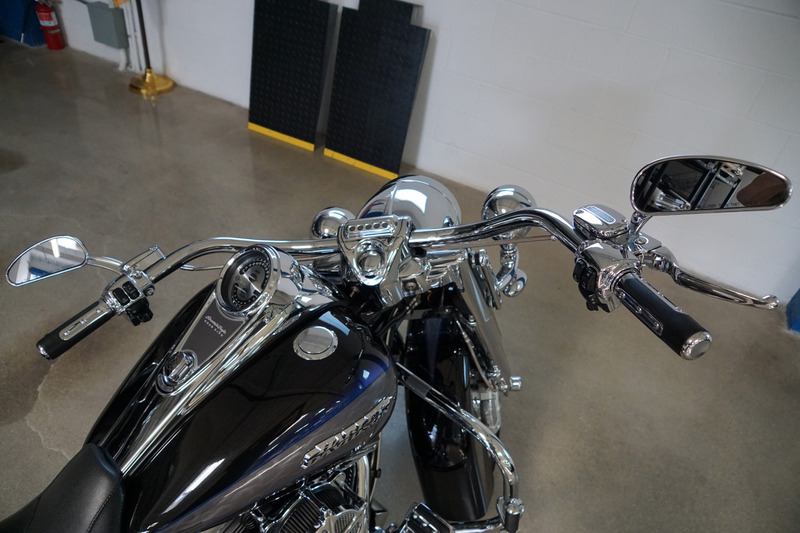 While the 2008 Harley-Davidson Screamin' Eagle Road King may seem the ultimate in niche motorcycle marketing, the truth is that it lived up to the hype. Powered by the largest-displacement engine in the H-D fleet - 110 cu or 1800 cc - this Road King produces a healthy 115 lb-ft of torque at 3000 rpm. This power is delivered via Harley's electronic throttle control and fuel injection system. Riding around town, this is enough pull to move the Harley down the road at a brisk rate, despite the bike's hefty curb weight (somewhere north of 750 pounds). Out in the open, the Road King feels completely at ease motoring along in the 85 mph range, feeling as if it has plenty of power left in reserve. And, of course, cracking the throttle produced that familiar exhaust roar that diehard Harley fans could not live without. For those riders who like to stick closer to home, the Screamin' Eagle Road King is a fine ride for boulevard cruising. 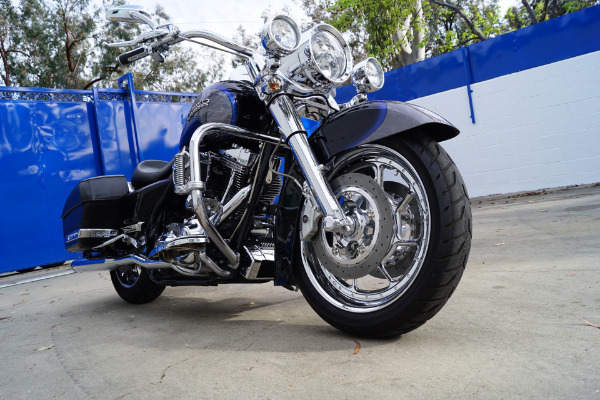 The custom Road Winder wheels and acres of chrome - on the hand grips, foot boards, brake pedal, shifter, front fork sliders and engine components - make this machine gleam even on a cloudy day. There were also three new paint schemes to choose from in 2008, including a special 105th-anniversary copper and black model. 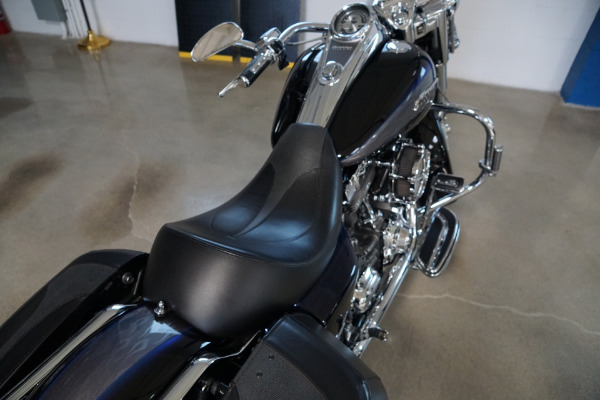 The look of the Road King is capped off with the tombstone-shaped tail lamp, detachable smoked windscreen, and detachable rider and passenger backrests. 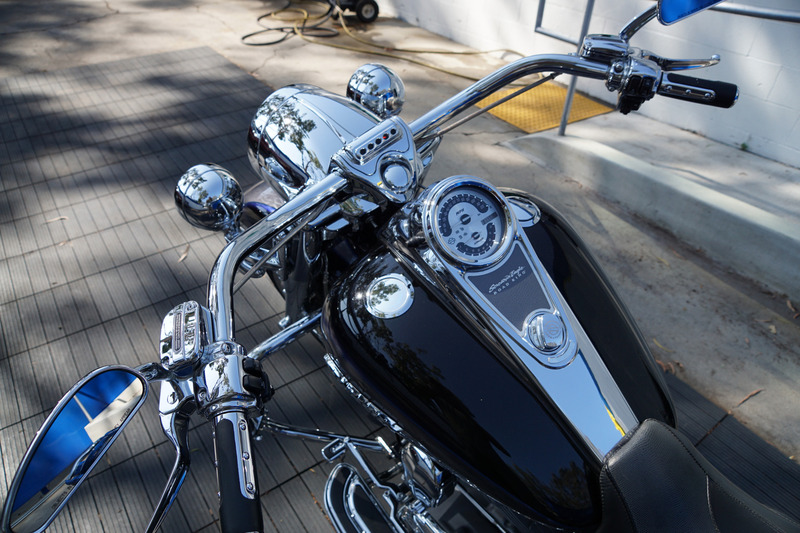 In photos and in person, this bike definitely makes a statement. To haul out an aging move quote: "It looks like money." And it certainly draws more than its fair of attention from those onlookers who have always thought of quitting their jobs and taking to the open road in the pursuit of some romantic ideal. 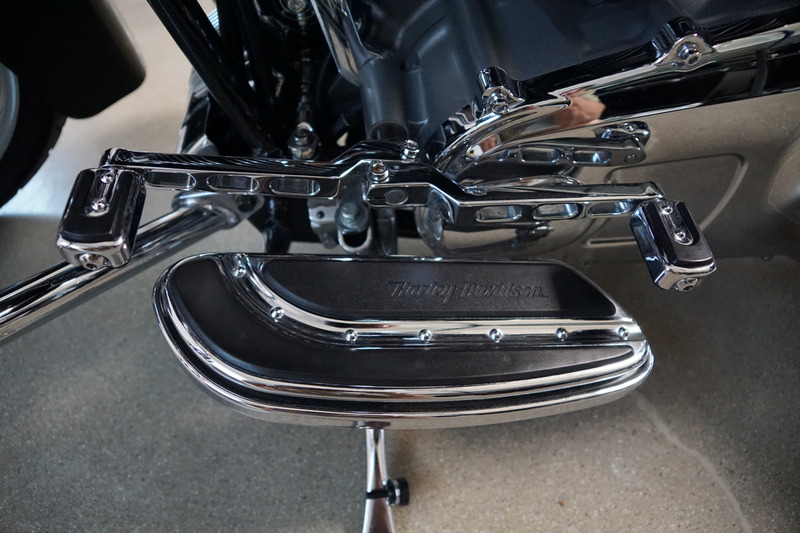 In this way, the Screamin' Eagle Road King is the very definition of a dream machine. 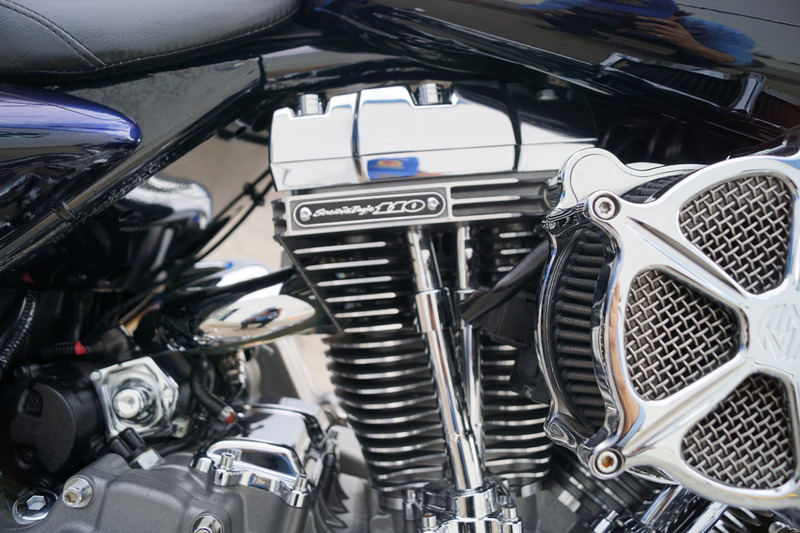 As with all CVO models, the 2008 Harley-Davidson Screamin' Eagle Road King was produced in limited numbers. 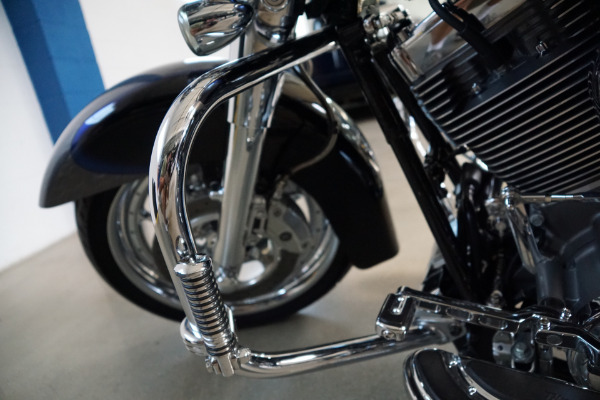 The factories built approximately 3150 models for the new model year, with 1800 of those bearing the anniversary paint scheme. 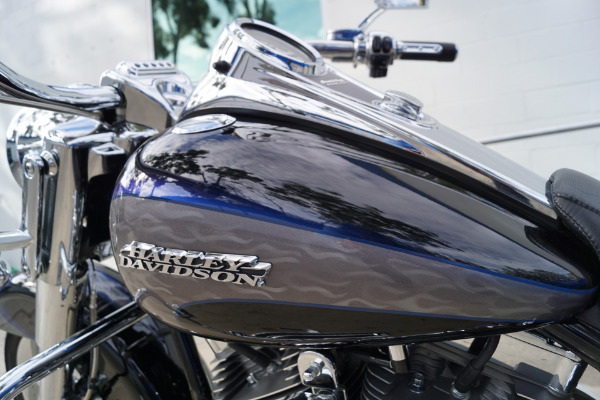 The MSRP for the bike was an astronomical $29,290 and the special paint added to that tally which made the Screamin' Eagle Road King one of the most expensive cruisers on the market. 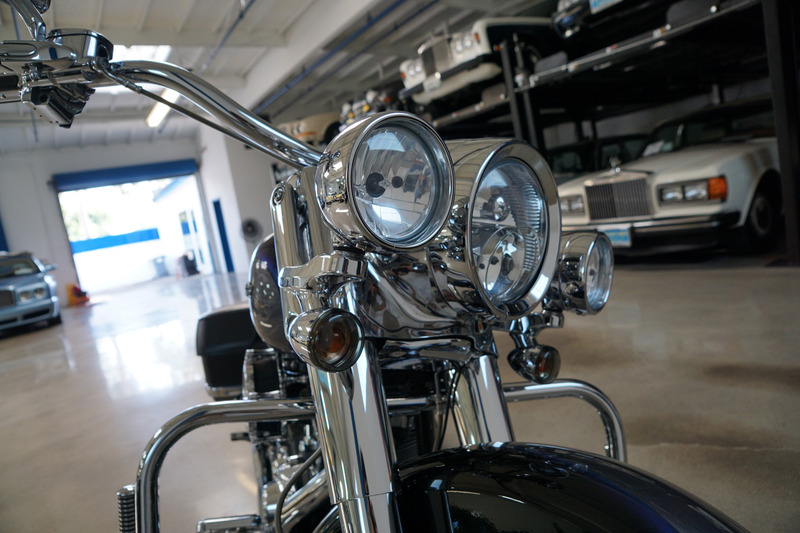 Working deep within the Motor Company's hallowed hallways and offices, a small group of men and women have the task of building super-Harleys. Officially known as Custom Vehicle Operations, or CVO for short, this group of eager and excited engineers and designers break out the slide rules, CAD programs and H-D's parts bible to design the Screamin' Eagle (SE) line of bikes. Each year since around 2001, the CVO teams have dug deep to produce limited-production factory custom and performance motorcycles. 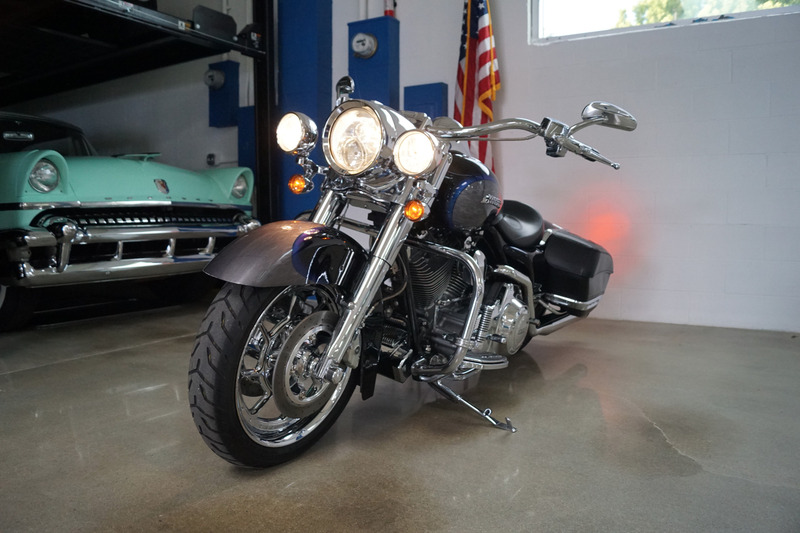 Of the four 2008 CVO models, two were touring machines: the SE Road King and the SE Ultra Classic Electra Glide. 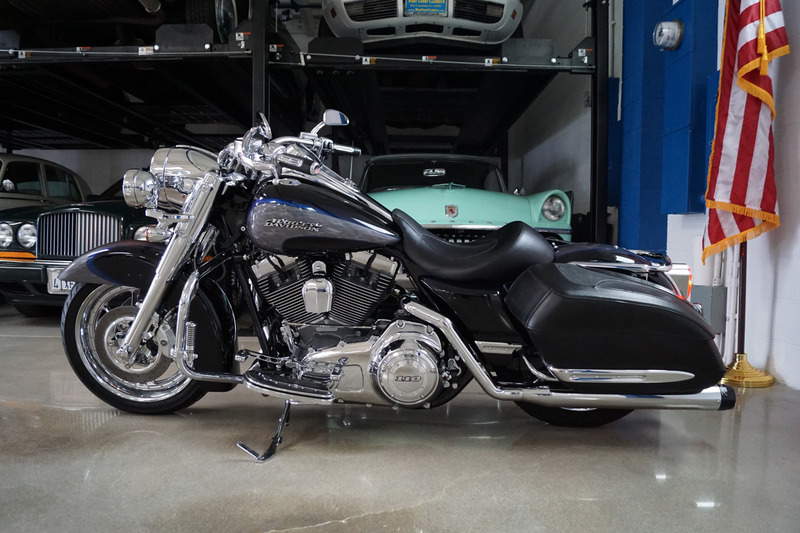 This is the fourth time the MoCo has chosen the Road King platform for a power, accessory and shine makeover. Aside from the visually appealing package, the exclusive highlight of this motorcycle has to be the 110ci Twin Cam A motor. Those extra cubes can be felt from the moment you thumb the starter. 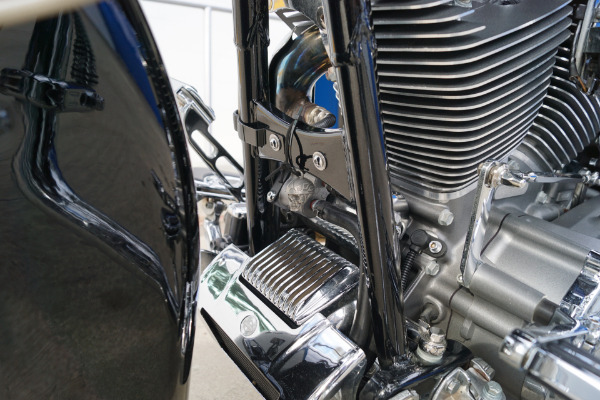 Even with a higher-output starter along with electronic compression releases in the cylinder heads, there's a bit of a crunch upon initial start-up. 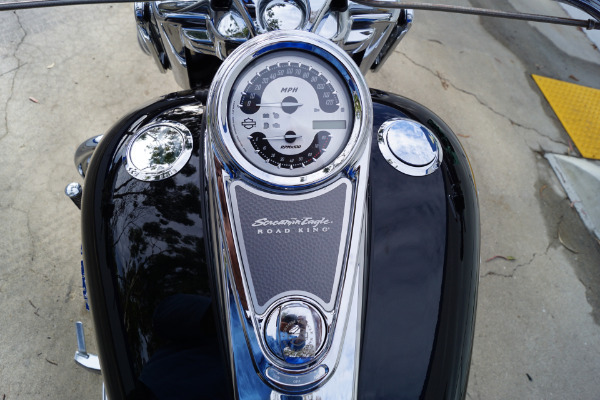 While sitting at a red light, you may find it most pleasant to rev the motor a bit above idle to quell the vibes. 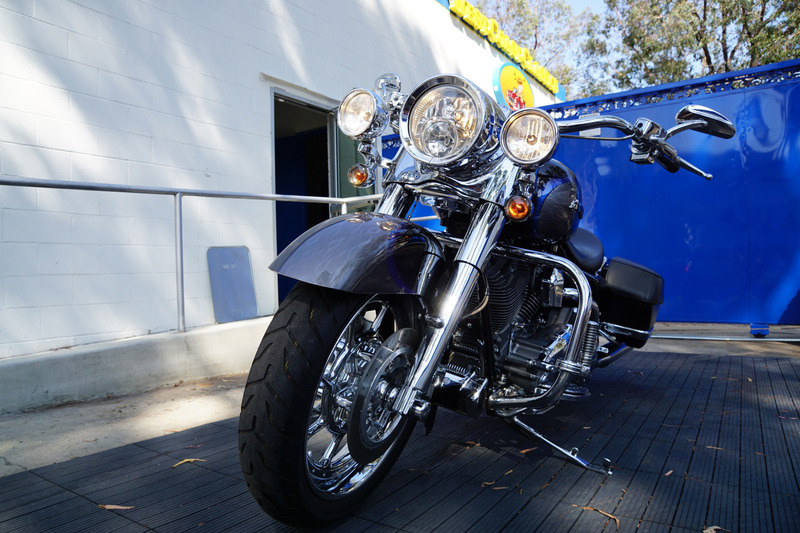 However, once moving, the bike never lets motor vibes get through. 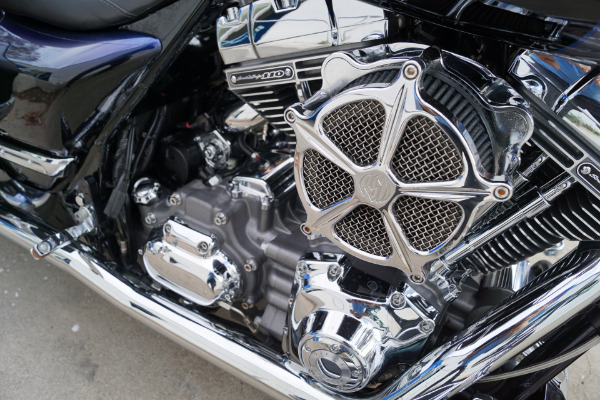 This has to be the most fun-to-ride, air-cooled motor H-D has ever made. Claimed torque is reported as 115 lb-ft at 3000 rpm. 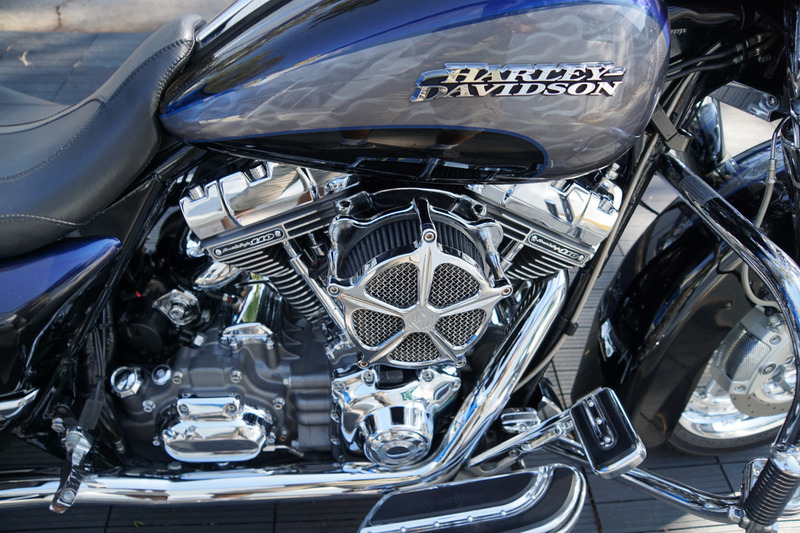 It's easy to feel that 20-plus percent increase in power compared to the 96-inch Twin Cam. Aside from the granite and chrome motor finish that's exclusive to CVOs, there are other parts of the motor that received special attention. 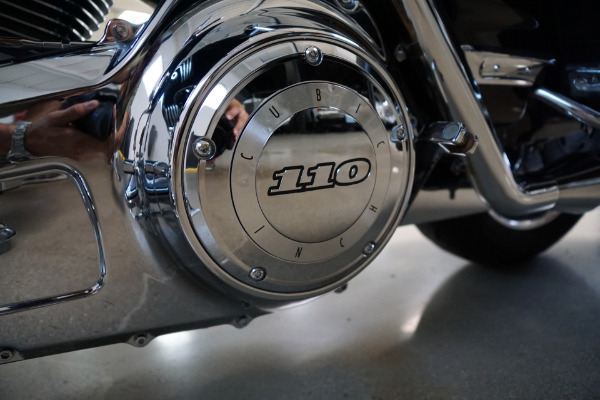 The 110, besides getting 1/4 inch of extra bore per cylinder, also received forged pistons and wrist pins. 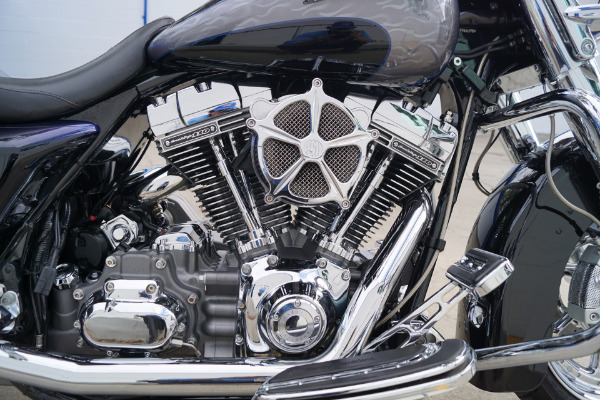 Air/fuel passes through high-flow intake ports and humongous 2.08-inch intake valves into the improved combustion chamber. 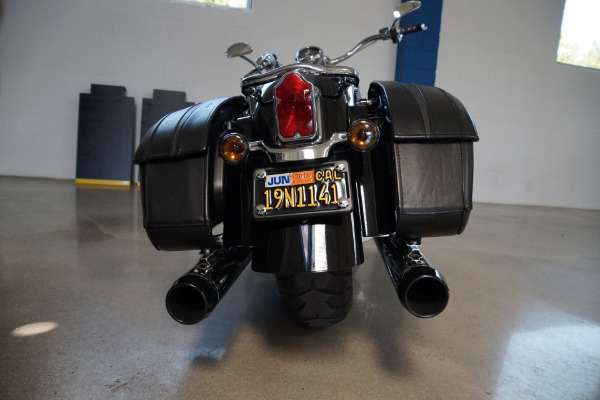 A large-capacity, crossover dual exhaust system has a very deep rumble. It's hard to believe they passed the noise police standards, they sound that good. 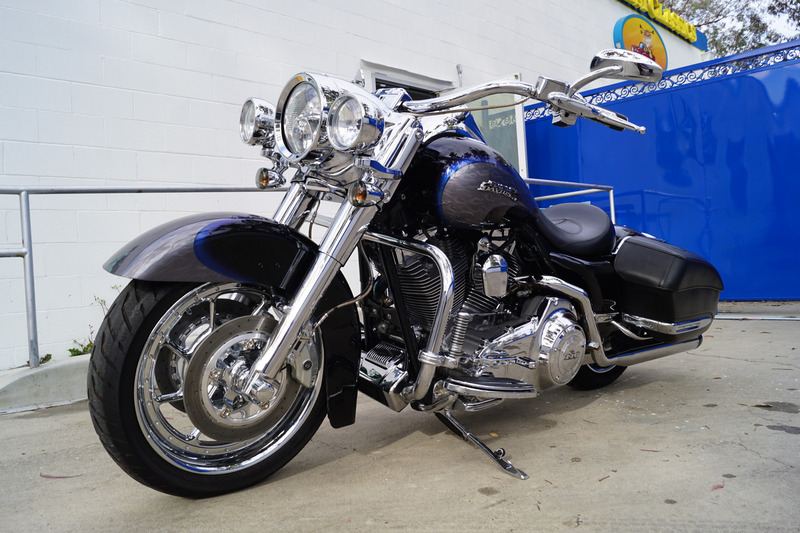 They work, too, as the Road King has the highest power rating of all the 110-equipped bikes - a result of the pipes. 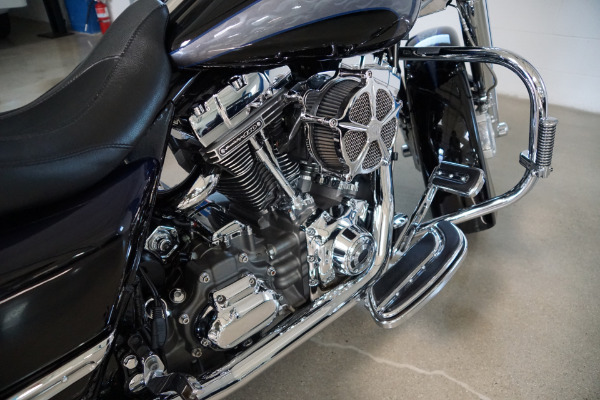 All of that power is transmitted to the Cruise Drive six-speed transmission through a stronger, hydraulically activated wet clutch. 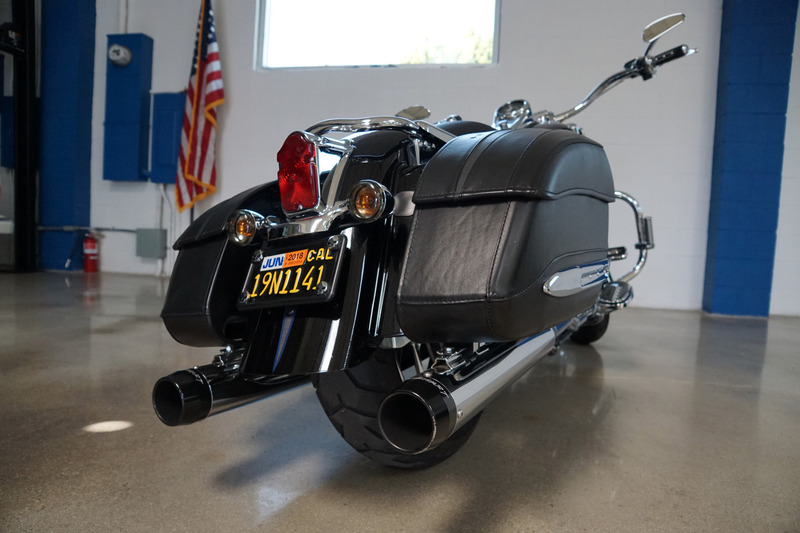 On the open road is where this bike shines. 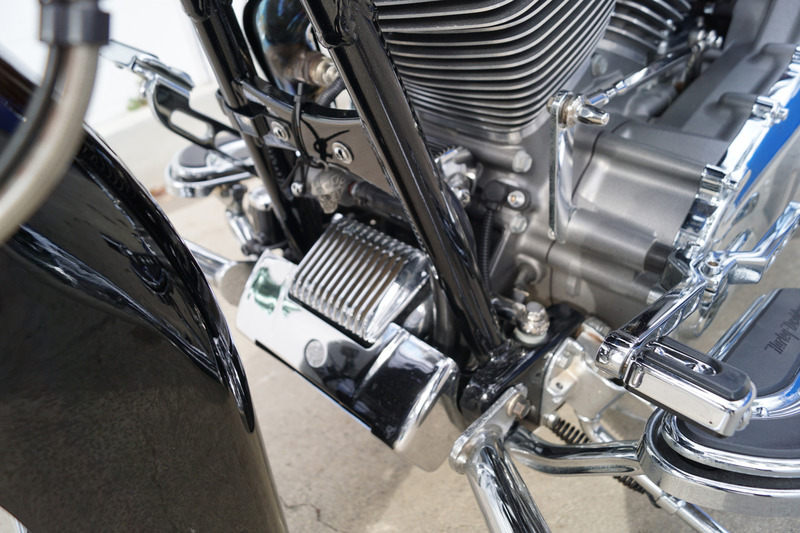 With the primary and transmission gearing, the motor is pulling 3000 rpm at 80 mph in sixth gear. That's exactly where the powerband is on this motor, and it accelerates briskly without downshifting. 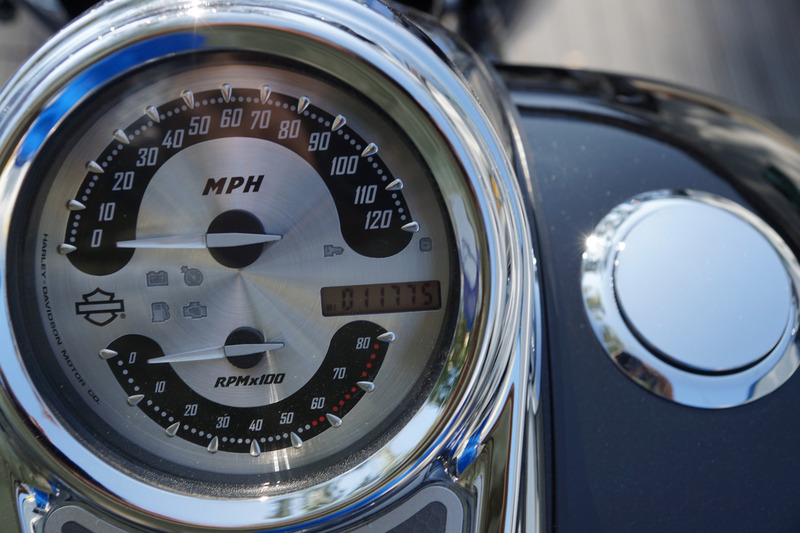 Anything under about 60 mph and a downshift is the best way to get going in a hurry. 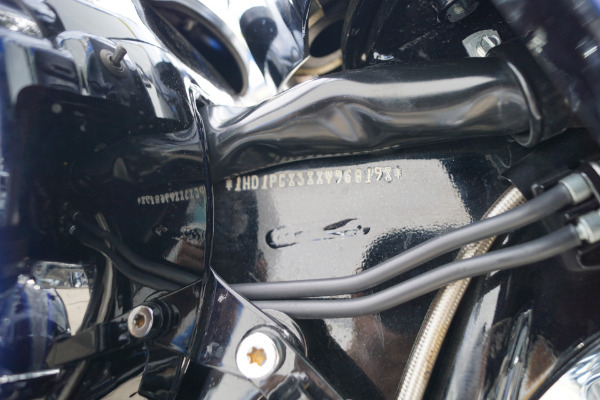 All of the '08 touring bikes received the cableless electronic throttle control, where a hidden electric wire sends a signal (via the ECM) to a motor in the throttle body to control airflow and injector operation. It works best once you're at cruising speeds but is very sensitive and abrupt at slower speeds. Handling is superb for a big bike like this. It feels much smaller than its dimensions would lead one to believe. 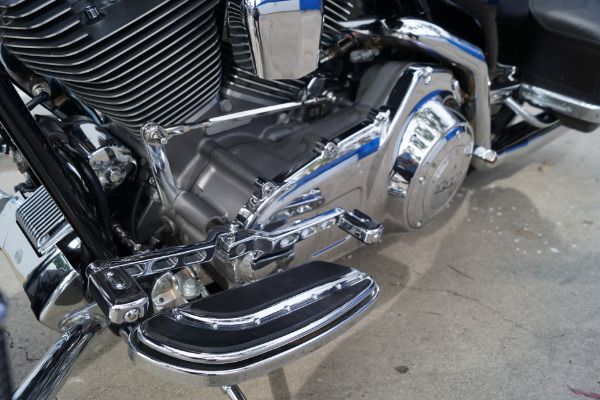 Although the SE RK is an inch shorter than the standard Road King, the CVO version has almost 1/2 inch more ground clearance. 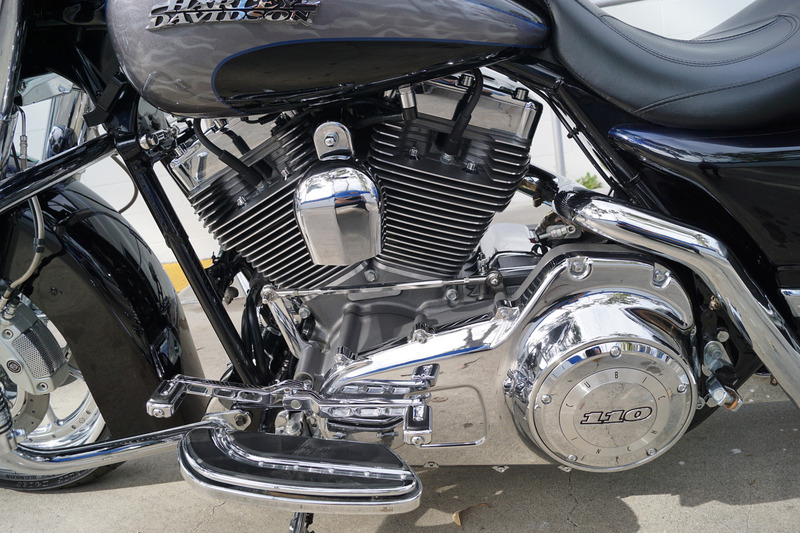 Suspension was tight and predictable, without the squishy unnecessary nosedive we've encountered from other H-D touring bikes. This is important, as the dual four-piston Brembo front calipers are absolutely amazing. They're almost too good and require attention when applying the binders. Feel and modulation is soft and natural, albeit a little bit grabby. 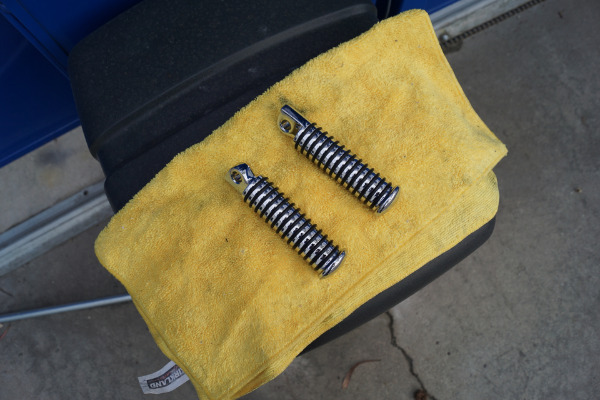 It takes some practice to unlearn how to brake with a fistful of force. 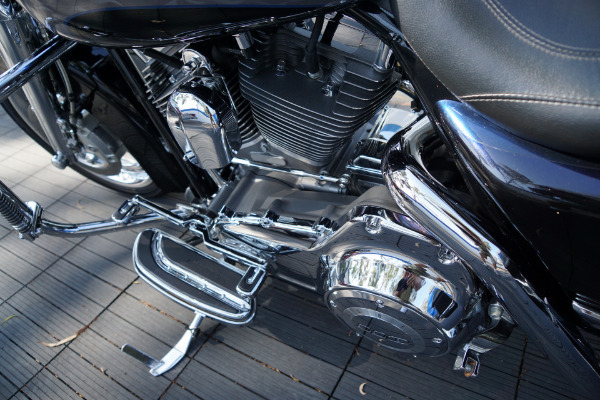 Although the bike is equipped with antilock braking technology, it rarely engages the passive system. 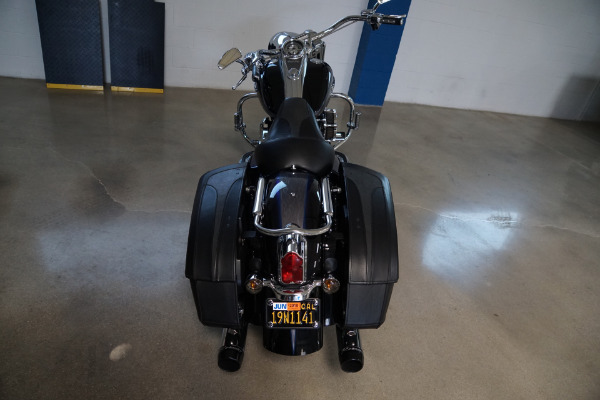 It only operates under full-braking, lock-up conditions, like in the rain or gravel. A nice upgrade is the Dunlop radial tires that keep the bike planted and stable under all riding conditions. 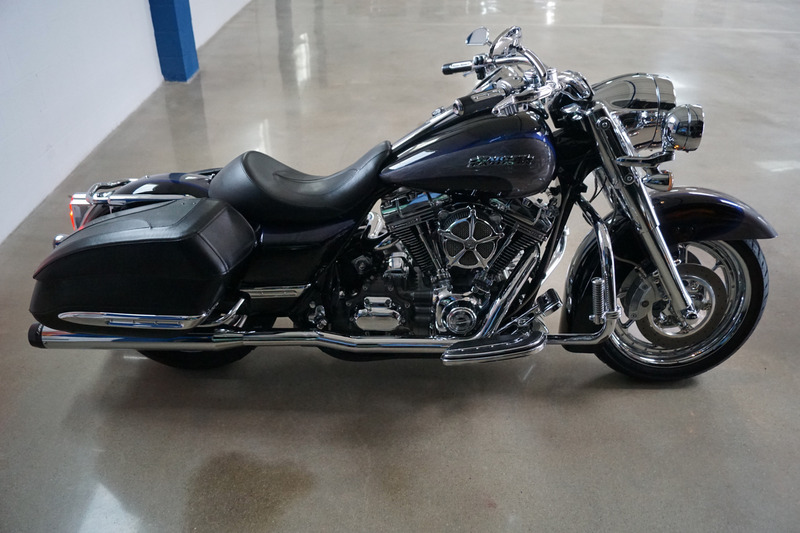 Fit and finish are top-notch on this bike. Chrome accessories are everywhere the eye looks, from the Ironside collection accessories to the forged aluminum wheels. 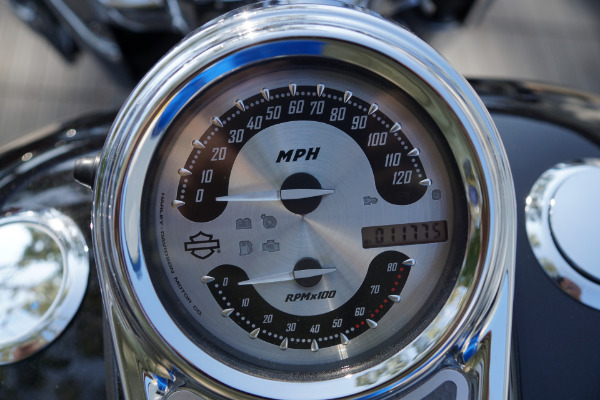 On the instrument side of things, a custom, tank-mounted, spun-aluminum gauge, electronic speedometer/tachometer with odometer and two resettable tripmeters keep track of the pace. 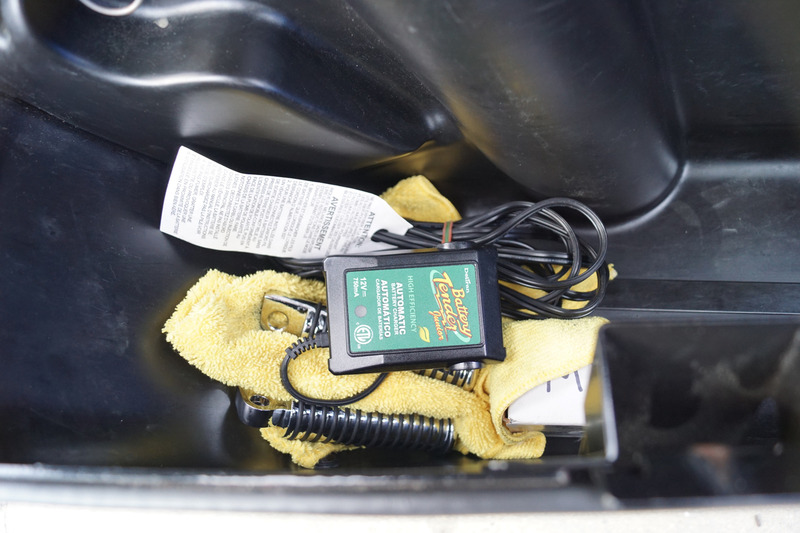 Other info that's displayed is engine diagnostics, low-fuel warning, cruise control, security system, battery, sixth speed and ABS operation. 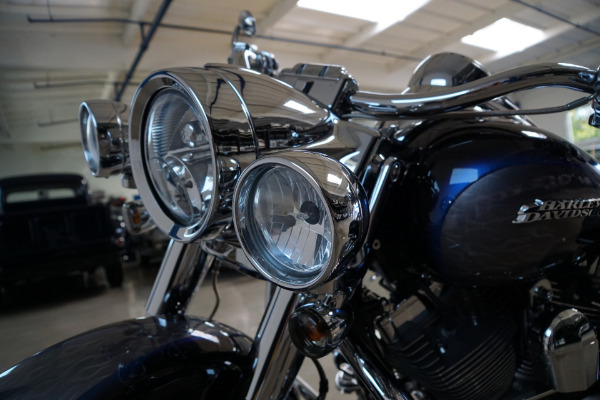 Indicator lamps integrated into the top handlebar riser display high-beam, neutral, low oil pressure and turn signal status. 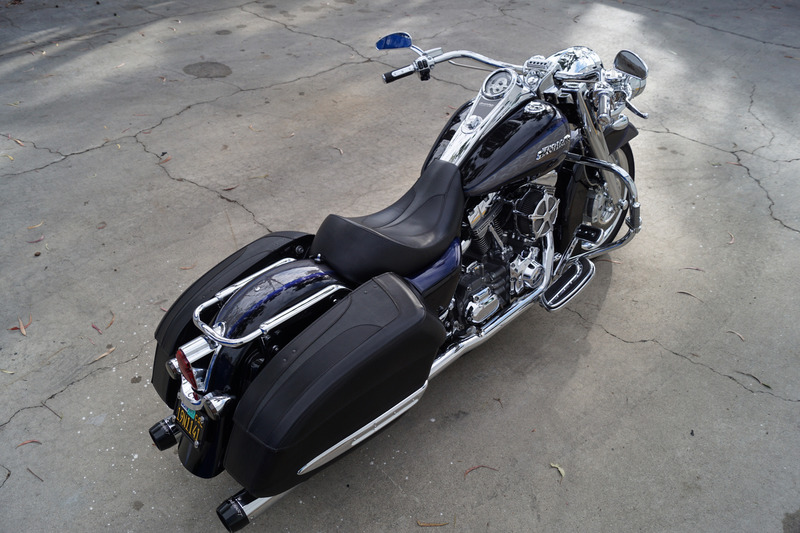 Even the frame and swingarm were color-matched to the rest of the bike. 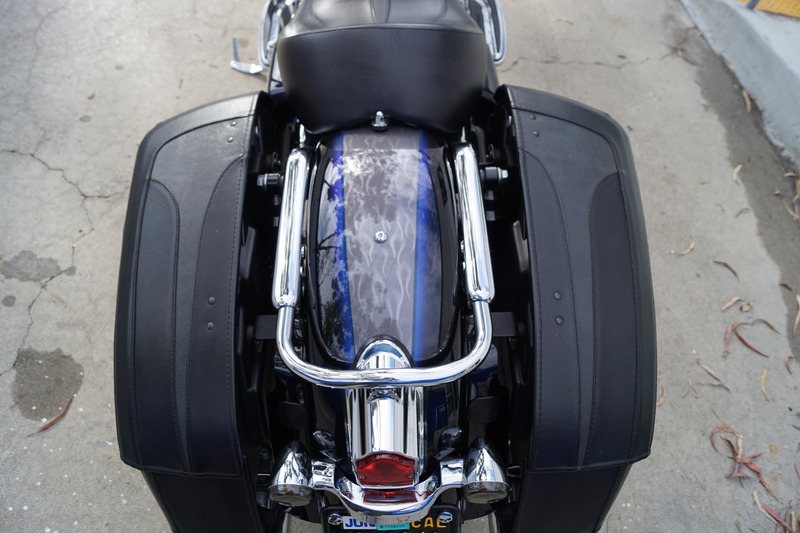 On the sheetmetal, lighter blue ghost flames lay deep beneath the cobalt blue finish. At different viewing angles, the graphics come and go. 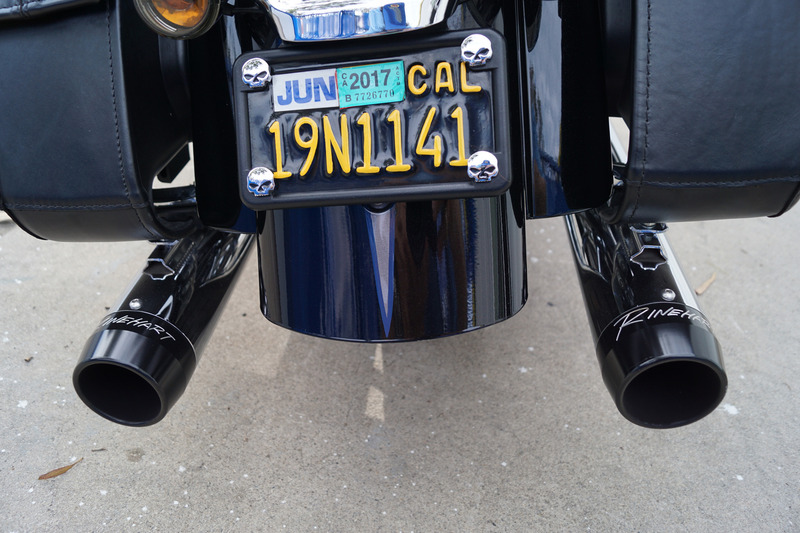 Purchased and ridden since new by only two southern California owner/riders and obviously never dropped or abused - a true garage Queen if ever there was one, ridden for only 11K careful miles and then garaged and covered! 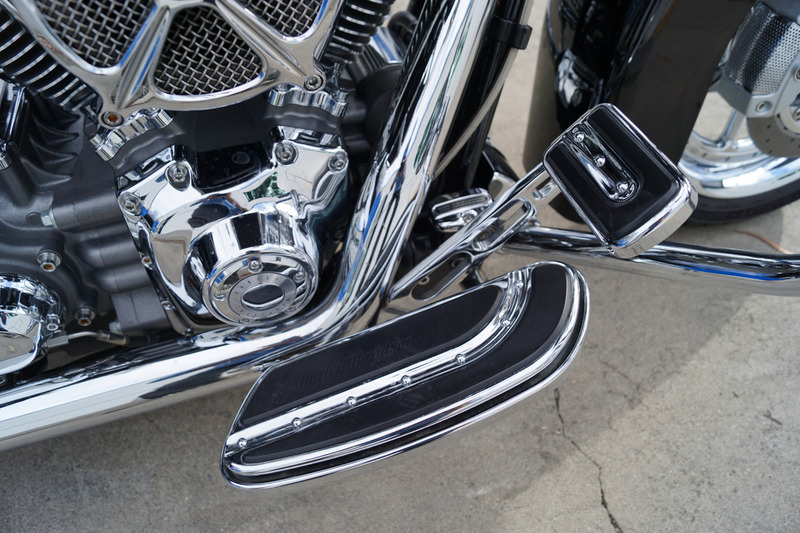 With virtually every conceivable available option, virtually fully chromed and with all original Harley Davidson parts and added options of the desirable 'Rhinehart' exhausts. If any Harley-Davidson is as much fantasy as motorcycle, this top of the line Screamin Eagle Road King takes the dream to the next level! 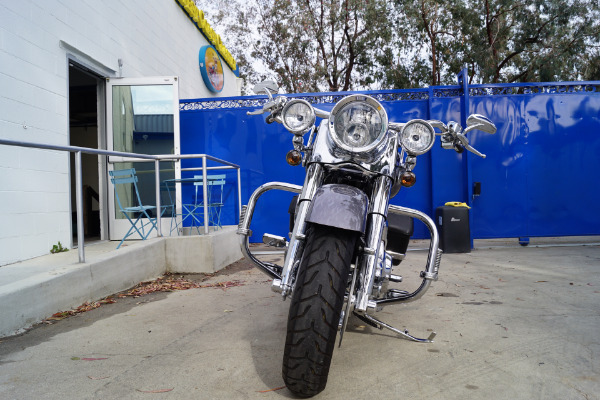 Come service time, this Hog can even talk to Harley-Davidson mechanics as well since the engine management system contains full diagnostic capabilities! 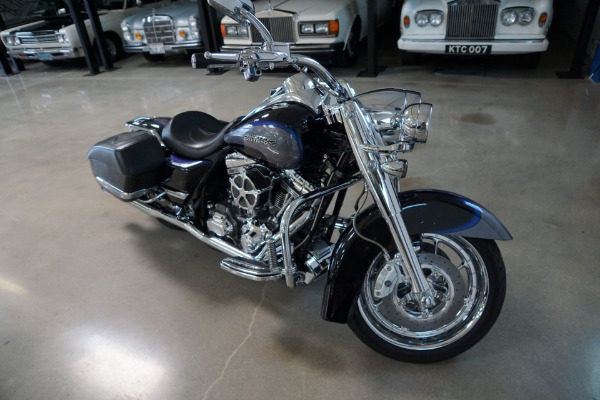 This highly striking example is obviously mechanically and cosmetically as new and you will obviously look long and hard to find a finer example of this highly desirable Limited Edition iconic Harley available anywhere else!